. . . MICHAEL MORREALE . 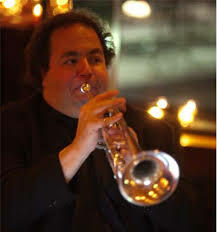 . .
New York trumpeter MICHAEL MORREALE is a veteran jazz artist with tenure in groups led by Jimmy Knepper, Chuck Wayne, Scott Hamilton, and the Turk Van Lake Orchestra. Michael has performed at Lincoln Center and recorded six albums and two sound tracks with Joe Jackson. Michael's stellar resume includes many of the giants of jazz, but none come out in his playing more so than the legendary trumpeter Don Joseph. Michael's close relationship and apprenticeship under Don Joseph appears in almost every solo Michael plays. It is evident that Joseph's influence is never very far from Michael's heart, but Michael's voice is his own and the little glimpses he gives in his solos of Don Joseph is a testimony to Michael's superior musicianship.